RooterNow offers water heater repair services for the Greater Sharelston, SC area! 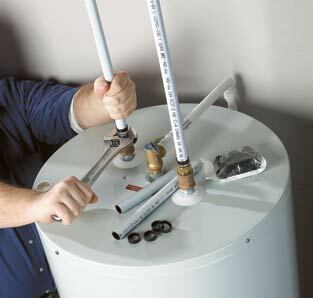 Storage-tank water heaters are the most popular and least costly products (both to buy and install). However, these appliances use more energy than tankless systems, since you’re paying to keep the entire tank of water hot until you need it. Compare tankless water heaters with tank water heaters. Like most appliances, water heaters have improved greatly in recent years. Today’s models are much more energy efficient. That’s why you probably couldn’t replace your existing water heater with the same exact model – and you probably wouldn’t want to. Instead, you may be able to purchase a more efficient water heater that will save you money on energy each month. That’s why you shouldn’t just consider the initial purchase price – think about how much it costs to operate. You could save hundreds of dollars in the long run by choosing a more energy efficient water heater model. The principle of heating is simple and is used commonly throughout the world. A copper coil is used to transform electricity into heat energy for the purpose. Several modifications have been made to this design over the course of time. However, the basic principle remains the same. These water heaters can be installed almost anywhere. They are easier to handle. The energy source required to heat the water is less expensive. As there is no combustion of fuel, there is no emission of carbon monoxide, and there happens to be no need of ventilation. The basic advantage of electric water heaters is that the speed of heating is extremely fast. The average life expectancy of an electric heater is more than that of a gas heater. Electricity is a must for its operation. The purchasing cost of this water heater is more than the gas water heaters. The cost incurred in operating an electric water heater is more expensive than a gas water heater. There can also be a potential danger of a short circuit or a fuse blow-off. Need An Electric Water Heater Repair? Generally electric hot water heaters are very reliable but if you are experiencing any of the following issues it is best to get a qualified RooterNOW® plumber to inspect your water hot water heater and make any recommendations. Contact us today about our electric water heater repair services or to have an energy efficient water heater installed for the Greater Charleston, SC area!